Not valid with any other offer. With Valpak® coupon only. Coupon void if altered. Expires 05/04/2019. Valid 11am-3pm. Not valid with any other offer. With Valpak® coupon only. Coupon void if altered. Expires 05/04/2019. If you’re obsessed with Japanese foods such as sushi bar rolls, stir-fried foods, curries and other savory favorite flavors from the Orient, visit Kanji Japanese Restaurant in Mount Joy, PA. We offer a fine lunch and dinner menu served all day, so grab some chopsticks and order up. Choose from salmon, tuna, yellowtail, white tuna, scallop and many other fresh fishes & shellfish by the piece. You’ll also find dozens of cooked and raw specialty sushi rolls on our menu. 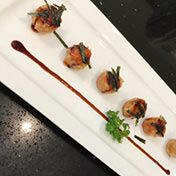 Or, try one of our lunch specials, combo plates or Japanese entrees. Redeem our coupons and save on our Japanese foods. Lunch & Dinner Menus, Hot Appetizers, Chilled Salads & Hot Soups, Chef's Specialty Dishes, Curry Dishes, Stir-Fried Noodles, Fried Rice, Sushi Bar Cooked & Raw Rolls, Signature Rolls, Sushi Entrees, Sashimi, See our website for more items on the menu. 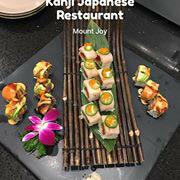 Kanji Japanese Restaurant in Mount Joy, PA is close to the Pennsylvania cities of Donegal Heights, Donegal Springs, Rheems, Sporting Hill, Salunga-Landisville and other area cities.